The world communicates on fiber optics. Fiber has become the communications medium of choice for telephones, cell phones, CATV, LAN backbones, security cameras, industrial networks, just about everything. Hundreds of submarine cables connect the world for data, voice and video. The biggest advantage of optical fiber is the fact it is the most cost effective means of transporting information. FIber can transport more information longer distances in less time than any other communications medium, as the photo on the left from the late 1970s illustrates so well. The bandwidth and distance capability of fiber means that fewer cables are needed, fewer repeaters, less power and less maintenance. In addition, fiber is unaffected by the interference of electromagnetic radiation which makes it possible to transmit information and data with less noise and less error. Fiber is lighter than copper wires which makes it popular for aircraft and automotive applications. These advantages open up the doors for many other advantages that make the use of optical fiber the most logical choice in data transmission. These advantages have led to fiber becoming the transport medium of choice for practically all data, voice and video communications. Both telcos and CATV operators use fiber for economic reasons, but their cost justification requires adopting new network architectures to take advantage of fiber's strengths. LAN and premises network designers and installers now realize that they must also adopt new network architectures too. A properly designed premises cabling network can also be less expensive when done in fiber instead of copper. Conversion from copper networks is easy with media converters, gadgets that convert most types of systems to fiber optics. Even adding the cost of the media converters, the fiber optic network will usually be less than copper when the proper architecture is used. Telephone networks were the first major users of fiber optics. Fiber optic links were used to replace copper or digital radio links between telephone switches, beginning with long distance links, called long lines, where fiber's distance and bandwidth capabilities made fiber significantly more cost effective. Telcos use fiber to connect all their central offices and long distance switches because it has thousands of times the bandwidth of copper wire and can carry signals hundreds of times further before needing a repeater - making the cost of a phone connection over fiber only a few percent of the cost of the same connection on copper. They even use fiber to connect cell phone towers to save limited radio spectrum. 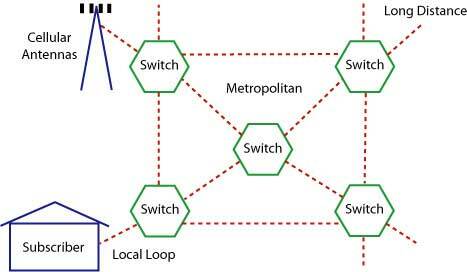 After long distance links were converted to fiber, telcos began replacing shorter links between switches with fiber, for example between switches in the same metropolitan area. Today, practically all the telephone networks have been converted to fiber. Telcos and other groups are now running fiber right to the home, (FTTH) using low cost passive optical network (PON) systems that use splitters to share the cost of some fiber optic components among as many as 32 subscribers. 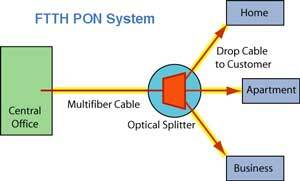 More on FTTH, FTTH PON types and FTTH network architecture. Even cell phone networks have fiber backbones. It's more efficient and less expensive than using precious wireless bandwidth for backbone connections. Cell phone towers with many antennas will have large cable trays or pedestals where fiber cables connect to the antenna electronics. 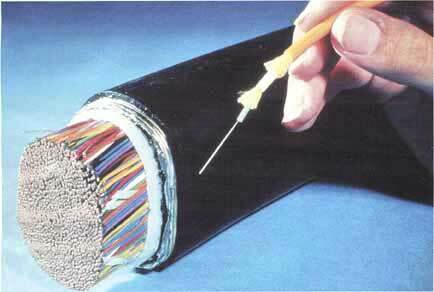 The Internet has always been based on a fiber optic backbone. It started as part of the telephone network which was then primarily voice but has become the largest communications network as data traffic has outgrown voice traffic. Now the telcos are moving their voice communications to Internet protocol (IP) for lower costs. Most CATV systems are using fiber backbones too. CATV companies use fiber because it give them greater reliability and the opportunity to offer new services, like phone service and Internet connections. CATV used to have a terrible reputation for reliability, not really a problem with service but with network topology. CATV uses very high frequency analog signals, up to 1 GHz, which has high attenuation over coax cable. For a city-wide system, CATV needed many amplifiers (repeaters) to reach the users at the end of the system; 15 or more we common. Amplifiers failed often, meaning that subscriber downstream of the failed amp lost signal. Finding and fixing failed amps was difficult and time consuming, causing subscriber complaints. The development of highly linear distributed feedback (DFB) lasers allowed CATV systems to be converted to analog optical systems called HFC - hybrid fiber coax - networks. CATV companies "overbuild" with fiber. They connect their headends with fiber and then take fiber into the neighborhood. They lash the fiber cable onto the aerial "hardline" coax used for the rest of the network or pull it in the same conduit underground. The fiber allows them to break their network into smaller service areas, typically fewer than 4 amplifiers deep, that prevent large numbers of customers from being affected in an outage, making their network more reliable and easier to troubleshoot, providing better service and customer relations. The fiber also gives CATV operators a return path which they use for Internet and telephone connections, increasing their revenue potential. Most current CATV systems still use AM (analog) systems which simply convert the electrical TV signals into optical signals. Look for them to convert to more digital transmission in the future. The development of these hybrid fiber-coax (HFC) networks and the cable modem allowed CATV companies to offer the first real broadband Internet services. The development of the cable modem and the HFC network created a digital network capable of delivering Internet at speeds much higher than digital services over telephone lines, with only fiber to the home (FTTH) being able to exceed cable modem speeds. CATV companies have developed their own FTTH services over passive optical networks called RFOG that allows them to be competitive with FTTH services. 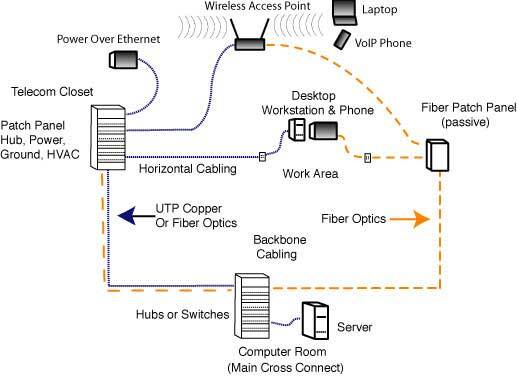 Premises networks, mostly computer LANs (local area networks) use fiber optics primarily in the backbone but increasingly to the desk and to connect wireless access points. The LAN backbone often needs longer distances than copper cable (Cat 5/5e/6/6A) can provide and of course, the fiber offers higher bandwidth for future expansion. Fiber's ability to handle network upgrades meant that one fiber type outlived nine generations of copper cables in LANs. A new fiber type (OM3) offers future potential for upgrades while copper continues to struggle with network speed increases. Until recently large corporate LANs use fiber backbones with copper wire to the desktop. LAN switches and hubs are usually available with fiber optic ports but PCs have interfaces to Ethernet on copper. Inexpensive media converters allow connecting PCs to fiber. Fiber to the desk can be cost effective if properly designed using centralized fiber architecture without local switching in the telecom closet, but many users no longer want to be "tethered" to a network cable. Desktop computer sales are declining and laptops are the PC of choice for most users, with wireless connections to the network. Generally only high data users like engineers and graphics designers use desktop workstations; everybody else gets a wireless-connected laptop. More on premises networks and fiber in premises networks. When most contractors and end users look at fiber optics versus Category-rated UTP cabling for a LAN, they compare the same old copper LAN with fiber directly replacing the copper links. The installed cost of a fiber optic cable plant comparable to the cost of Cat 5/6/6A, but fiber often requires medial conversion electronics which add cost to the link for fiber. However, the real difference comes if you use a centralized fiber optic network - shown on the right of the diagram above. Since fiber does not have the 90 meter distance limitation of UTP cable, you can place all electronics in one location in or near the computer room. The telecom room is only used for passive connection of backbone fiber optic cables, so no power, UPS, ground or air conditioning is needed. These auxiliary services, necessary with Cat 5 hubs, cost a tremendous amount of money in each telecom room. If designing a new building, you do not even need the cost of the telecom room itself. In addition, having all the fiber optic hubs in one location means better utilization of the hardware, with fewer unused ports. Since ports in modular hubs must be added in modules of 8 or 16, it's not uncommon with a hub in a telecom closet to have many of the ports in a module empty . With a centralized fiber system, you can add modules more efficiently as you are supporting many more desktop locations but need never have more than a one module with open ports. Now premises networks are being built from the same equipment used for FTTH (see above). The high volume of FTTH has driven costs low enough that LANs can be built from the same passive optical network components as FTTH at lower costs than traditional LANs. More on passive optical LANs, or passive OLANs. Many other networks use fiber. CCTV often uses fiber for it's distance capability and security, especially in large buildings like airports and metropolitan networks. Security systems are more secure on fiber. Practically any network today has a fiber optic option. Many cities have incorporated fiber optics into their communications networks. Metropolitan networks use fiber for many other applications besides CCTV surveillance cameras, including connecting public service agencies such as fire, police and other emergency services, hospitals, schools and traffic management systems. Cities can install cables to strategic locations so various services can share the fibers in the cables, saving installation costs. Cities are also learning to bury conduit every time a roadway is dug up so when cables need installing, no further construction is needed. Industrial plants use fiber for it's ruggedness, distance and noise immunity. In an industrial environment, electromagnetic interference (EMI) is often a big problem. Motors, relays, welders and other industrial equipment generate a tremendous amount of electrical noise that can cause major problems with copper cabling, especially unshielded cable like UTP. In order to run copper cable in an industrial environment, it is often necessary to pull it through conduit to provide adequate shielding. Fiber is also very flexible, so many industrial robots use fiber for controls, often plastic fiber. Fiber optics has complete immunity to EMI. You only need to choose a cable type that is rugged enough for the installation, with breakout cable being a good choice for it's heavy-duty construction. The fiber optic cable can be installed easily from point to point, passing right next to major sources of EMI with no effect. Conversion from copper networks is easy with media converters, gadgets that convert most types of systems to fiber optics. Even with the cost of the media converters, the fiber optic network will be less than copper run in conduit. Utilities use fiber for communications, CCTV surveillance and network management. Electrical utilities take advantage of fiber's immunity to noise also, even running fiber inside high voltage power distribution cables. Some utilities install fibers inside their high voltage distribution networks and lease fibers to other telecommunications companies. Utilities use fiber in one non-communications application; fiber optic sensors allow monitoring high voltage and current in their distribution systems. The interest in "smart grid" management of power distribution to enhance efficiency is based on using fiber optics for network management. The military uses fiber everywhere, on bases, platforms (ships and planes), and on the battlefield because it's hard to damage, tap or jam. Airplanes use fiber for its reliability and noise immunity, but also like the lighter weight of fiber. Even millions of cars have fiber networks connecting all the electronics because fiber is immune to noise and saves weight. Fiber optic links work by sending optical signals over fiber. Fiber optic transmission systems all use data links that work similar to the diagram shown above, where date is sent in opposite directions on separate fibers for full duplex operation but in some networks like a Fiber To The Home (FTTH) passive optical network (PON), signals are sent in both directions over a single fiber. Each fiber link consists of a transmitter on one end of a fiber and a receiver on the other end. Transmitters are semiconductor LEDs or lasers and receivers are semiconductor photodetectors. 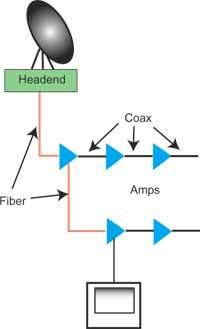 Some systems use wavelength division multiplexing to send multiple signals over a single fiber. This is a big topic so we have a complete section on the subject later in the book. Fiber's extra bandwidth and distance capability makes it possible to do things not possible with copper wire or wireless. First and foremost, it's necessary to understand thoroughly what signals are to be transmitted over the fiber and the specifications of the transmission equipment. Then map and visit the work site to understand where the fiber optic cable plant needs to be installed. Know the standards but use common sense in designing the installation. Consider what are the possible problems and work around or prevent them. Don't cut corners which may affect performance or reliability. Document everything completely. Plan for future expansion and restoration in case of problems. There is no substitute for experience and common sense here! (C)1999-2018, The Fiber Optic Association, Inc.